New collabo brought Eminem and Royce back to the studio. Are they shooting a Caterpillar video? 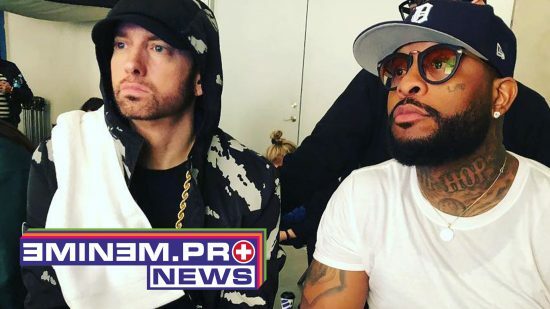 A few hours ago Royce 5’9 posted a photo of him and Eminem on his Instagram, where they sit together. They gazing at … something … «B.M.E.» – commented Royce, which means Bad Meets Evil. Maybe these two, inspired by the joint work on the track “Caterpillar” from Royce’s studio album «The Book of Ryan» (which, by the way, will be released on May 4! ), decided to return to the studio as BME duo? ?? Listen to Eminem’s snippet of the upcoming track “Caterpillar”, which was produced by S1 (Symbolyc One) and EpikhPro. Previously, S1 produced Eminem’s track “Bad Guy” and the collaboration with 50 Cent “My Life”. — ROYCE (@Royceda59) 1 мая 2018 г.